Here we will look at the Spreadsheet Service and The Mail Service for Apps Script. You can Access , Modify and Create (Google Docs) Spreadsheets using the Spreadsheet Services of Apps Script. Google Apps Script for spreadsheets combined with the existing functionality of Google docs Spreadsheets, like Calculations and Cell functions like Xpath , makes for a very powerful business tool. value in the "Status" column. 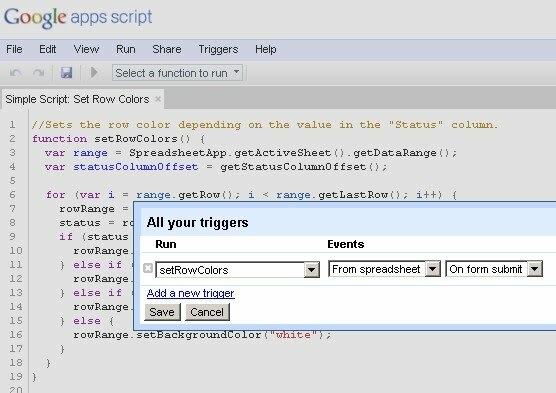 There are also Apps Scripts Event Handlers for Spreadsheet with will run automatically and trigger the Script you have installed. The example above function uses the Apps Script - Event Handler OnFormSubmit and changes the Color of Cells when the form below is submitted . OnOpen - Apps Script is triggered when Opening a spreadsheet. OnEdit - Apps Script is triggered when Editing a spreadsheet. OnInstall - Apps Script is triggered when a Script is Installed. OnFormSubmit - Apps Script is triggered when a Form is Submitted to a Spreadsheet. You must create or add a function for the Spreadsheet/Form, then It will be available to trigger. Select Add New Trigger - Under 'Run' you will see the Functions Inserted /created. The Form has 3 columns Project, Priority and Status. It is important for this particular script that the 'Status' column name does not change. The Order does not matter in this example. The Apps Script will format the Color of your selected Project by the 'Status' Selection. Note: The A to D columns last rows are only sent. you may require more Columns , If your form is larger. Follow the on form submit tutorial or add the main Mail function code to the existing colorchange function. If the spreadsheet is open it will also display a browser message of the Data that was sent by mail. You MUST RUN any additional new Services and Authorize them before they can run automatically. //Sets the row color depending on the value in the "Status" column.